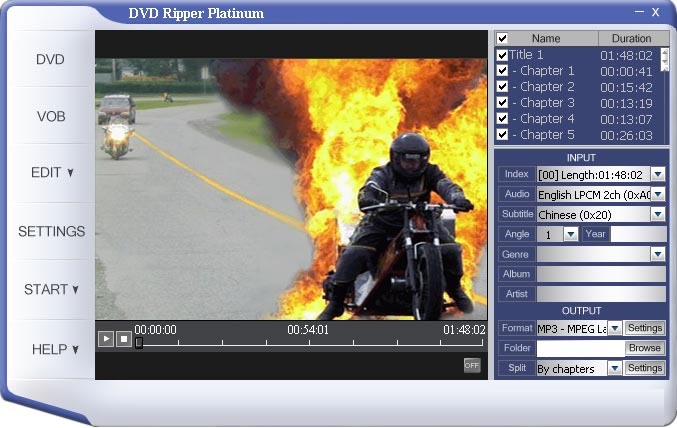 DVD Ripper Platinum is design for making backups of your favorite DVD movies to your computer by converting DVD to AVI, DivX, XviD, VCD, WMV, MPEG4 format video files, with almost same quality, but just only 10% size. With optimized profiles, you can convert DVD Movie to iPod Video, Microsoft Zune, Pocket PC, 3GP Mobile Phone or any other MP4 player, such as iRiver, Archos, Creative Zen Vision and more. Qweas is providing links to CNC DVD Ripper Platinum 2008.3.1.0423 as a courtesy, and makes no representations regarding CNC DVD Ripper Platinum or any other applications or any information related thereto. Any questions, complaints or claims regarding this application CNC DVD Ripper Platinum 2008.3.1.0423 must be directed to the appropriate software vendor. You may click the publisher link of CNC DVD Ripper Platinum on the top of this page to get more details about the vendor.